I propose a theoretical explanation for the puzzling pre-announcement positive drift that has been empirically documented before scheduled Federal Open Market Committee (FOMC) meetings. I construct a general equilibrium model of disagreement (difference-of-opinion) where two groups of agents react differently to the information released at the announcement and to signals available between two announcement releases. In contrast to traditional asset pricing explanations, this model matches key empirical facts such as (1) the upward drift in prices just before the announcement, (2) lower (higher) risk, price volatility, before (after) the announcement occurs, and (3) high trading volume after the announcement, while trading volume is low before the announcement occurs. es what kind of risk is embedded in it.Over the past decades, stocks in aggregate have experienced large positive excess returns in anticipation of scheduled FOMC announcements and, to a certain extent, in anticipation of scheduled corporate earnings announcements. I will refer to this phenomenon as the pre-announcement drift. I will claim that, while traditional asset pricing explanations would fail to match the empirical evidence, a model of disagreement based on Dumas et al. (2009), henceforth DKU, creates sentiment risk that matches the stylized facts documented empirically in the literature. fference-of-opinion because they disagree on a fixed parameter of the model. They, therefore, do not learn from each other's behavior nor from price but simply "agree to disagree". fits from potentially using the information to be acquired. Therefore, agents will choose not to acquire information, which will bring agents to drastically reduce their disagreement level. When agents stop acquiring signals, the reduction in disagreement leads to a reduction of sentiment risk that manifests as an increase in prices; this increase in prices will match the pre-announcement drift. Low volatility will be observed in the pre-announcement period, where there is low sentiment risk; and high volatility will be observed after the announcement, where there is an increase in sentiment risk. Finally, high trading volume will occur just after the announcement is released, since this is the point in time with the highest level of disagreement and it would be at its lower point just before the next announcement occurs." 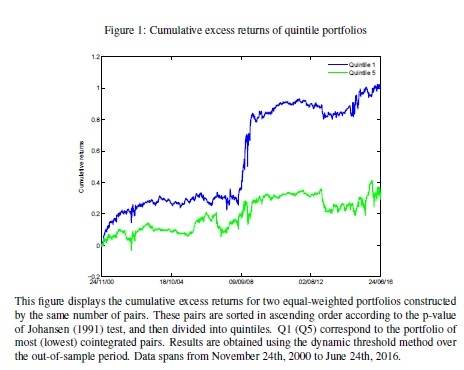 "This article uses an out-of-sample analysis of S&P100 equity data to analyze performance of pairs trading portfolios when sorted by the level of cointegration of their constituents. 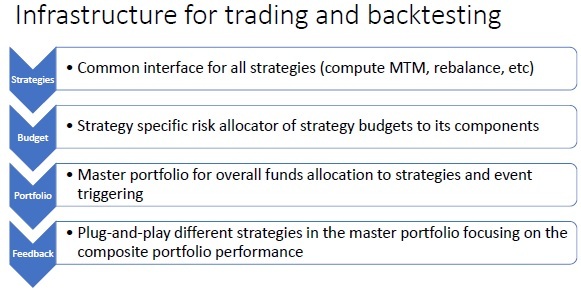 We focus on the supercointegrated portfolio, that is formed by pairs in the top quintile of tradable targets, all of which do not reject standard cointegration tests at the 1% significance level. Indeed, the primary contribution of this article is to show that pairs trading profitability is monotonically associated with the significance level of cointegration. For the supercointegrated portfolio, the average excess return of 6.2% is earned per annum which is 2.3% higher than the portfolio with pairs in the second quintile. 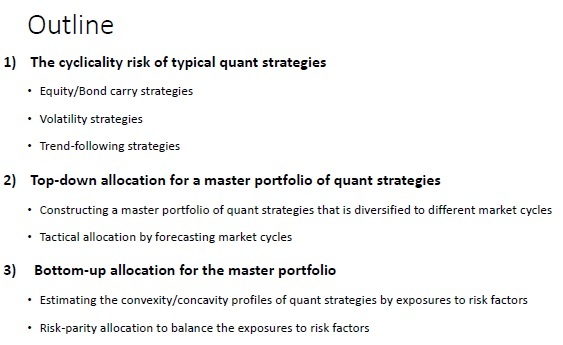 A similar finding is documented in terms of Sharpe ratio, which increases from 0.2 to 0.6 (yielded by the bottom and the top quintile portfolios, respectively). A regression of the returns of the supercointegrated portfolio against the 3-factor Fama and French (1992) model shows that the market is a statistically significant explanatory variable of the pairs trading profitability. Momentum and book-to-market ratio are not significant in this exercise. We analyze the sources of risk underlying the supercointegrated portfolio and show that portfolio risk can be linked to aggregate market volatility. We then account for volatility persistence by providing maximum-likelihood estimates of an AR(1) model in the realized volatility series. We find that pairs trading profitability exhibits volatility persistence which is linked to that reported for the market. This allows us to show that lagged market realized volatility can be used to explain current pairs trading profitability. Moreover the strength of the relationship between pairs trading profitability and realized market volatility is positively associated with the level of cointegration underlying pairs trading portfolios. An extended regression analysis demonstrates that the link between realized market volatility and pairs trading profitability is enhanced under bear market conditions. This stronger connection is exclusive to the supercointegrated portfolio. The empirical evidence provided in this article does therefore suggest that the significance level of cointegration can be used for portfolio ranking purposes. Moreover we show that this evidence is maintained under its application to European equity data. In parallel to our findings, this article conducts several exercises to assess the robustness of its main results. The additional checks conclude, once again, the strength of the supercointegrated portfolio. 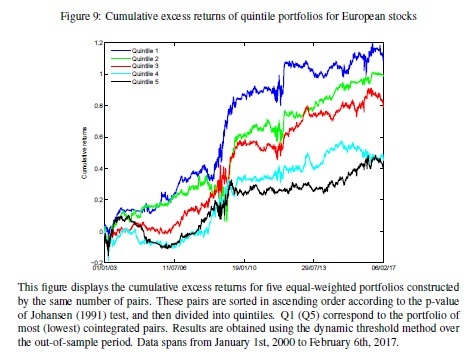 Using a newly constructed unique dataset, this study is the first to document returns of the market portfolio for a long period and with a high level of detail. Our market portfolio basically contains all assets in which financial investors have invested. We analyze nominal, real, and excess return and risk characteristics of this global multi-asset market portfolio and the asset categories over the period 1960 to 2015. The global market portfolio realizes a compounded real return of 4.38% with a standard deviation of 11.6% from 1960 until 2015. In the inflationary period from 1960 to 1979, the compounded real return of the GMP is 2.27%, while this is 5.57% in the disinflationary period from 1980 to 2015. The reward for the average investor is a compounded return of 3.24%-points above the saver’s. We also compare the performance of an investor who holds the market portfolio with an investor who uses simple heuristics for the portfolio allocation. 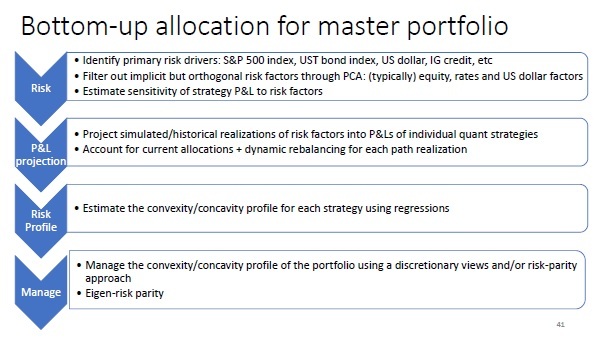 Our results suggest that the market portfolio is close to the mean-variance frontier, but our heuristic allocations achieve a significantly higher reward for risk. "This study aims to fill both a gap in the academic literature as well as a gap in return data availability for finance practitioners by providing returns of the global market portfolio (GMP) over the period 1960 to 2015 from the perspective of an USD investor. A study on returns of the GMP has not been done before for such a long period and with such a level of detail. We document in detail how we collected historical returns data on global asset classes, which is challenging for the period before 1985. Moreover, we make the resulting data publicly available so other researchers can use them in their own applications. Our GMP basically contains all assets in which financial investors have invested. This paper contains unique features compared to the scarce academic literature on international asset returns. First, our sample period significantly extends the 1960-1980 period of Ibbotson and Siegel (1983), who are the first with a rigorous study on a global multi-asset market portfolio. They find a nominal compounded return of 8.36% for their so-called world market wealth portfolio over the period 1960-1980. Compared to that study, we focus on assets in which financial investors have actually invested. For example, we do not take farmland into account, as it usually belongs to owners that do not hold it as a financial investment and thereby it is not publicly available. Second, in comparison with Dimson, Marsh, and Staunton (2002), a groundbreaking study that documents annual returns for equities, government bonds, and treasury bills in sixteen countries for the 101-year period 1900-2000, we include returns for more assets like for example corporate bonds and real estate. Also, we use an all-maturity market capitalization weighted government bonds index instead of a GDP-weighted long term government bonds index. The latter is less useful for representing the performance of the asset class global government bonds. Obviously, the length of their sample period remains unmatched. New data enables an extensive analysis of return and risk characteristics of the GMP and the asset categories over the period 1960 to 2015. We include conditional analyses on recessionary and inflationary periods. We also compare the performance of an investor who holds the GMP with an investor who uses simple heuristics for the portfolio allocation. By comparing the performance of the GMP with alternative portfolio allocation schemes, we can find out whether the GMP has been a good, if not optimal, portfolio during our 56-year sample period. 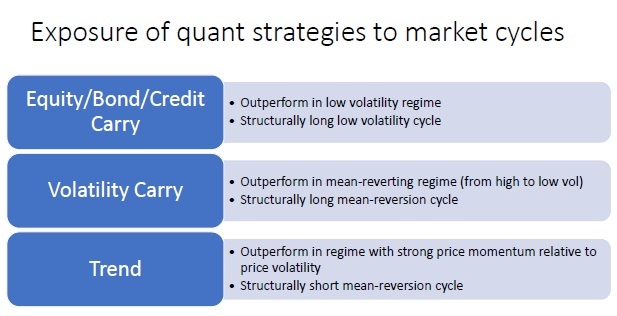 This analysis will also touch upon mean-reversion across asset classes. Moreover, this new data set provides an opportunity to gauge the difference in return and risk for the average investor and saver." What is the most significant contributing factor to the performance of a quantitative fund: its signal generators or its risk allocators? Can we still succeed if we have good signal generators but poor risk management? 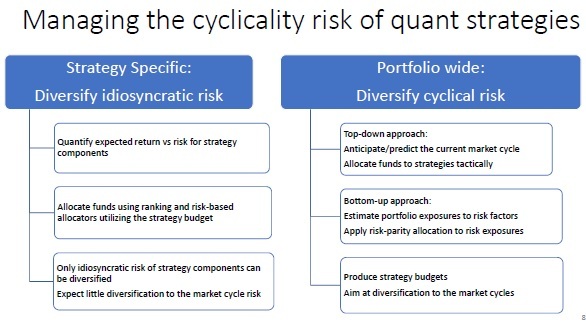 We illustrate a few examples using back-tested data using systematic quantitative strategies with risk-based allocators. The financialization of crude oil markets over the last decade has changed the behavior of oil prices in fundamental ways. In this paper, we uncover the gradual transformation of crude oil from a physical to a financial asset. Although economic demand and supply factors continue to play an important role, recent indicators associated with financialization have emerged since 2008. We show that financial variables have become the main driving factors explaining the variation in crude oil returns and volatility today. Our findings have important implications for portfolio analysis and for the effectiveness of hedging in crude oil markets. "We decompose the total variation of crude oil returns and volatility into three distinctive parts: One part that can be explained by economic fundamental factors, one part that can be explained by financialization variables, and a third which consists of the unexplained variation. While decomposing the returns provides information concerning the main drivers of crude oil as an asset, the volatility decomposition reveals the main factors of risk transmission. We show that the relative importance of economic and financial variables changes over time. In particular, the relative importance of financial variables has changed in such a way that crude oil is now closer to a financial asset than to a real physical asset. During the pre-financialization period, the contemporaneous variation in our eight regressors explains only a small percentage of the total variation in crude oil returns. After the default of Lehman Brothers, the situation changes dramatically. The same set of regressors now explain almost 60% of the return variation. Among the fundamental variables, economic activity and the change in the dollar exchange rate explain 8% and 12% respectively. The main drivers behind the variation in oil returns are however the financial variables. In particular, the change in the VIX and the S&P 500 returns are responsible for 29% of the variation. To illustrate this point, the average fraction explained by each set of variables is shown in Panel B of Figure 4. Since the beginning of the financialization period, the financial variables dominate the economic fundamental variables by a significant amount. Traditional fundamental variables have become relatively less important for predicting crude oil returns while recent financial variables can now predict a large share of the return variation. From this finding we conclude that the behavior of crude oil has become more similar to that of financial assets like equities rather than traditional economic demand and supply drivers. Financial variables can only explain 11% of the total variation in crude oil returns in the years prior to financialization, the impact grows to 35%, becoming the main drivers behind oil price movements. 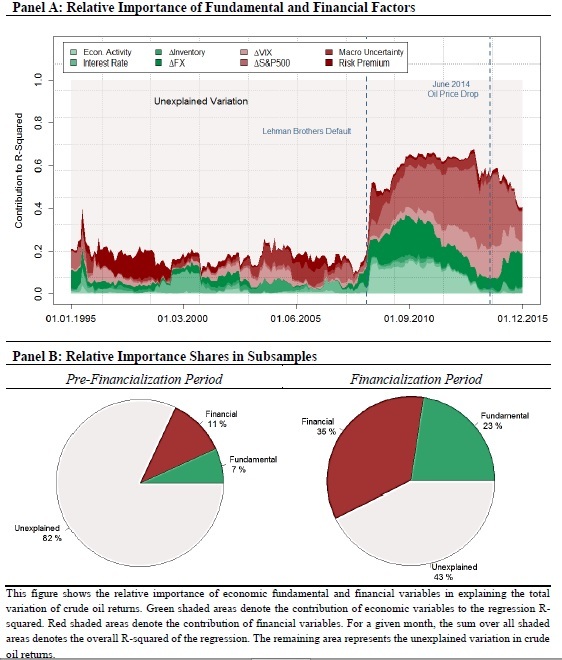 We estimate an even stronger effect on crude oil volatility where the impact of financial variables grows from 19% in the pre-financialization period to 53% since the failure of Lehman Brothers. Our empirical results indicate that crude oil markets underwent significant changes over the last years. These changes were sufficiently large to transform the very nature of crude oil, away from a physical real asset towards a variable that shows a behavior that is comparable to stocks, bonds, and other financial assets."